Holiday Planner Printable for Christmas | Nina Hendrick Design Co. Printable Holiday Planner | Get organized for the busy Thanksgiving & Christmas season and plan all of your events and shopping with this Printable Holiday Planner! Today I’m so excited to share my latest design with you- this printable Holiday Planner! I feel like every year the same thing happens- I become so overwhelmed by the minute details of the holiday season that I end up missing out on the really special time with my family. I’d much rather be making wonderful holiday memories than trying to remember if I got so-and-so a gift or sent that card. Are you with me? There are so many valuable pages in this planner- it’s fifteen pages long! I’m about to guide you through a tour of what it has to offer, but if you already know you want it, you can click the button below. 2018: The Holiday Planner is now part of Home School! Click here to learn more or sign up below for the waiting list. I’ve had this cover in my brain for a while now, and I used these watercolor elements to bring it to life. I love the mixture of classic red and green (it gives you a sneak peek of my Christmas decor plans!) but the fact that it represents natural greenery. My recommendation is printing on cardstock so that the cover will hold up a bit better. The holiday planner features calendars for both November and December. I left the dates blank intentionally so they can be used for multiple years! There is a task list running down the side of the page for reminders. 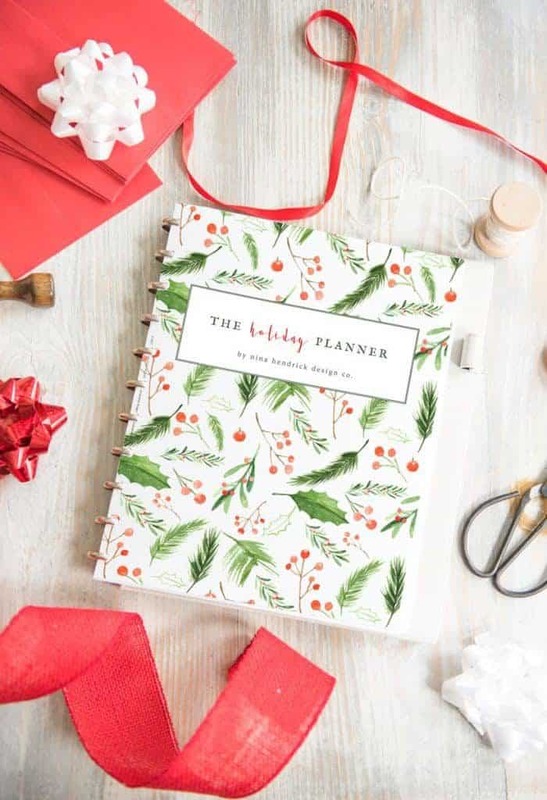 This budget tracker will help you stay on track with a plan for spending on different elements of holiday planning. This is just a general shopping checklist to help keep your shopping trips planned smoothly. This handy page helps you plan out your holiday gatherings so that you can enjoy a meaningful party with those you care about! This is a classic Christmas list for your children that has practical categories for things they may actually need as well as things they enjoy. This page keeps track of cards sent and received to make sure that you send to those who have sent one to you! There’s also space for their address. Similar to the holiday card tracker, this gift giving list makes sure that you keep track of all of the people that you’d like to send gifts to and have things shipped on time. I’m not personally one of the crazy people who stays up all night to fight over blenders in a crowded department store- but to each their own! Ha! I have friends who love Black Friday (I love to sleep- especially post-turkey) and they helped me design this planner. It includes a list of stores, times they open, and items you’ve scoped ahead of time. Good luck! Cyber Monday is much more my style! This tracker is similar to the Black Friday planner. However, it has a space for websites, coupon codes, times of sales, and which items you have your eye on. If you are DIYing some of your gifts or decor, this page helps you to plan your project out. There’s space for sketching, a shopping list, and a task list. This is a classic lined notes page. A few ideas are to use it as a free-write to envision what you would like to experience during the holiday season. You could create a family list of events. You can also use it to brainstorm ways to serve others during the season of giving. Whatever floats your boat- the sky is the limit! I hope you enjoy this planner and that it brings you peace and togetherness during this busy season. I wish you and your family the happiest of holiday seasons! You can see more of our Thanksgiving ideas here and Christmas ideas here! Love it! Great layout and it’s got everything I need. Can’t wait to print it off tonight! So happy you like it, Carmen! Enjoy! I love this, thank you so much. Will be printing out one for myself and 2 more for my daughters! Thank you so much for this wonderful planner, Nina! I just picked mine up from Staples (cardstock, plastic covers front and back, and spiral bound) and I LOVE it!! I will be organized this Holiday Season for sure!! Thank you! thank you! Love the cover. I’m not seeing the Holiday Project Planner page? Wanted to use for my DIY gifts. LOVE this! Printing it now, and will share with my blog readers.